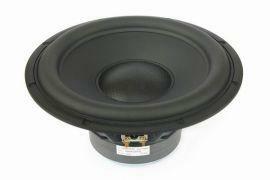 Subwoofer with aluminium chassis and aluminium 12″ cone. Peak excursion of Scan-Speak Discovery 26W/4558T00 is 56 mm, linear excursion - 25 mm. Discovery 30W/4558T00 subwoofer can be used together with Scan-Speak 30W/0-00-00 passive radiator.